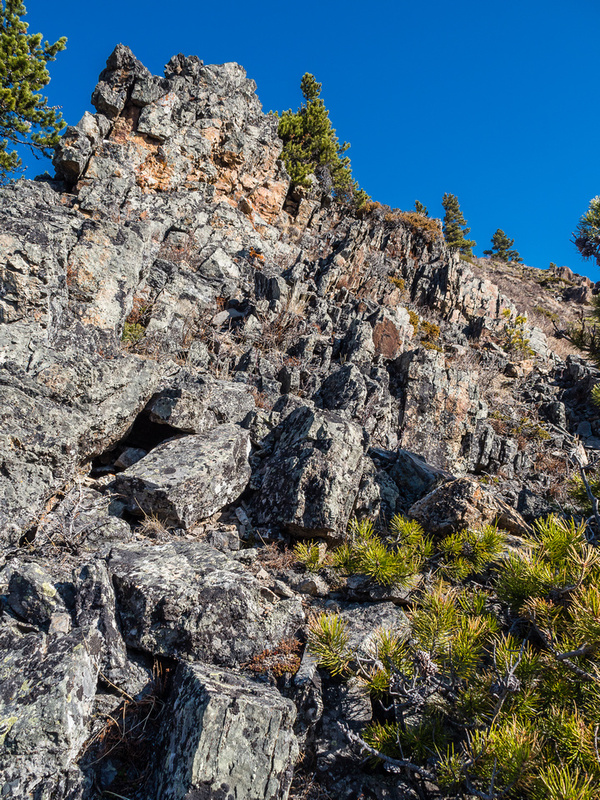 Difficulty Notes: Mostly an off trail hike with scrambling opportunities if you look for them. Saturday, April 28 2018 was forecast to be summer time in Alberta! 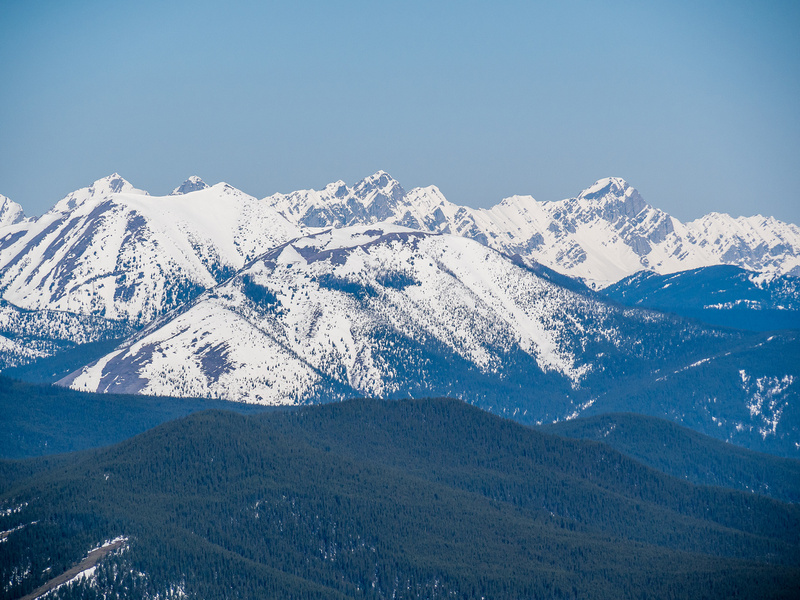 After a bitterly long and cold winter, April was ending on a high note with several days pushing 25 degrees above zero, even in the mountains. Of course, these temperatures were too warm to safely enjoy the snow pack so I was left wondering what to do on Saturday. Any meaningful scrambles weren’t in shape yet (way too much snow). I’d had Etherington-Baril on the list for awhile already and decided that since I was going to be solo, this was the day to try it. I had Hell’s Ridge in mind as a second summit for the day in case conditions and energy levels allowed, since it’s right in the vicinity anyway. I had zero expectations for this hike / scramble. Other than a gorgeous weather forecast, I was worried that I’d be ‘wasting a day’ on such a diminutive objective. Let’s be perfectly honest here. It’s normally quite tough to go from a lofty, gorgeous summit such as Mount Rhondda to a grassy bump within a couple of days of each other. 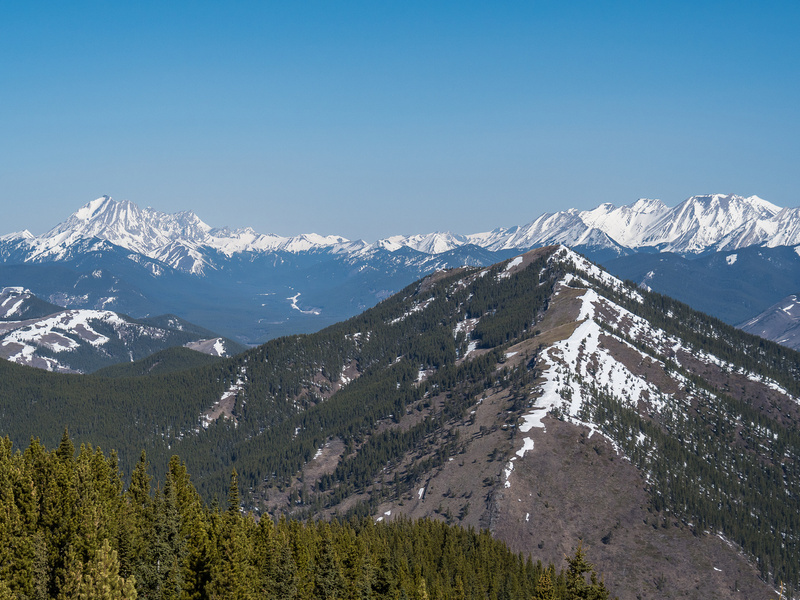 I’ve done many of the easy, grassy, treed summits in this area of the Rockies including Raspberry Ridge, Zypher Hills, Junction Hill and Coyote Hills. As enjoyable as these outings were, it was mostly due to the company and sheer desperation of getting out of the concrete jungle rather than the engagement of the landscapes themselves. As I finished the lovely drive down hwy 541 and the FTR to the Etherington Creek Provincial Recreation Area I had no reason to expect today was going to be any different. Sure! As I stepped out of the truck in a nearly empty parking lot, I immediately noticed that the weather was gorgeous and the air was remarkably calm. But. The ridge that was clearly visible off to the west looked very unremarkable. As a matter of fact, it looked plastered with snow, ensuring a miserable grunt along its summit ridge. I reluctantly put the snowshoes in my pack and set off down the approach road through the campground. Despite my hesitation at enjoying this meaningless hike, the Etherington Creek environment did its best to change my mind. The day started pretty good, with a very well packed snowmobile track along the approach road paralleling the creek. 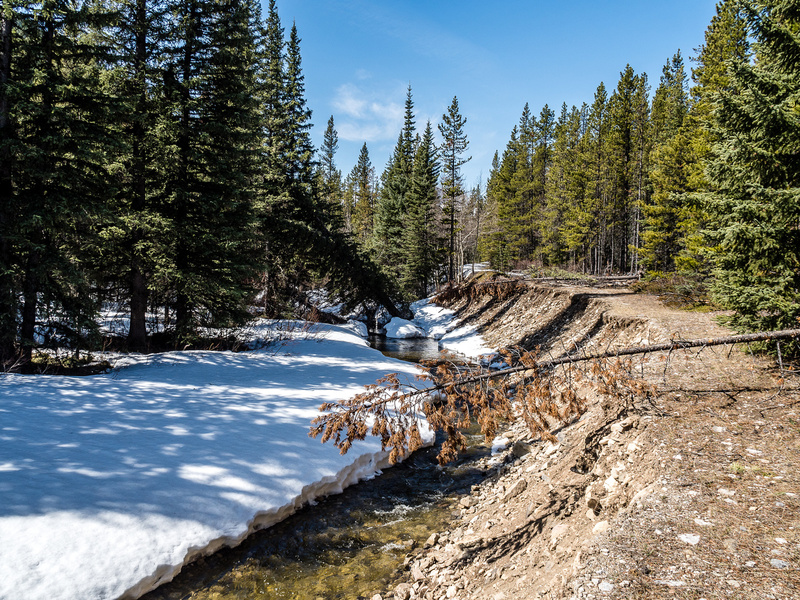 Birds were chirping, the sun was warm and the creek was cheerful as I walked over a bridge and scouted a route up the lower, bone dry slopes of the ridge on it’s southern end. 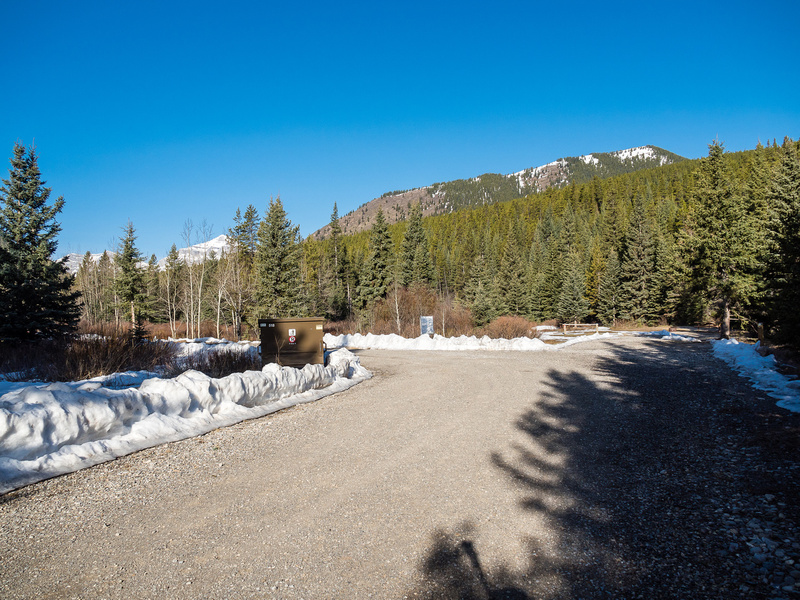 The campground is still closed this early in the season. E-B Ridge rises in the distance looking pretty snowy up top. Crossing Etherington Creek on a bridge along the approach road, E-B Ridge rising in the distance looking dry on the lower section at least. All right - I can deal with warm, dry rock. I immediately went left here to scramble up the ledges. What a glorious morning! Looking east and south now. Hell's Ridge at left and Raspberry Ridge at right. My approach and Etherington Creek at bottom center. Lots of easy, hands-on scrambling here. Views off the ridge towards Mount Etherington are unexpectedly nice already early in the hike. Looking over the Etherington Creek basin towards the High Rock Range. And even more very easy hands-on stuff. Views west were stunning despite the obvious clearcuts. From R to L peaks include, Baril, Etherington, Scrimger and Holcroft. A lovely little bench where I spotted the dark colored Marmot before he ducked into the rocks. I'm staring to realize that the western side of the south ridge might just be melted off. No snowshoes required! With zero wind and warm air, this part of the hike was pure magic. Old friends around Carnarvon Lake start showing up at distant left including Armstrong and MacLaren. Now we're cooking with gasoline! Fantastic mountain scenery. Far better views than expected looking north off the summit towards the Highwood Pass area along the High Rock Ranges at left and over Coyote Hills. Mist Mountain at distant left. Patterson's and Serendipity over Coyote Hills at right. Mist Mountain is huge at over 10,000 feet high. Eagle Ridge to the right is over 2,000 feet lower. Odlum Ridge is in front of Mist and not nearly as close to it as this telephoto shot would imply! 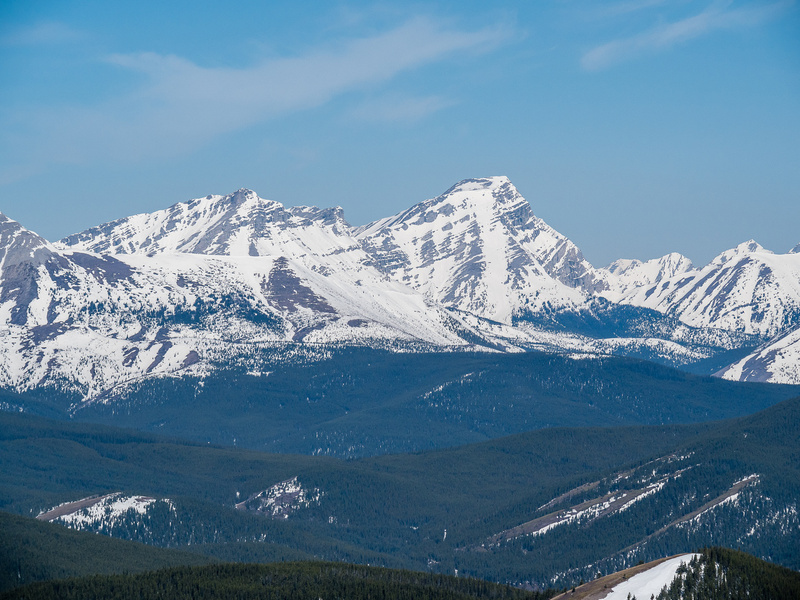 Gazing north towards the Highwood Pass area including Mount Loomis and Odlum rising over the Hill of the Flowers. Bishop Ridge rising just left of the hill. 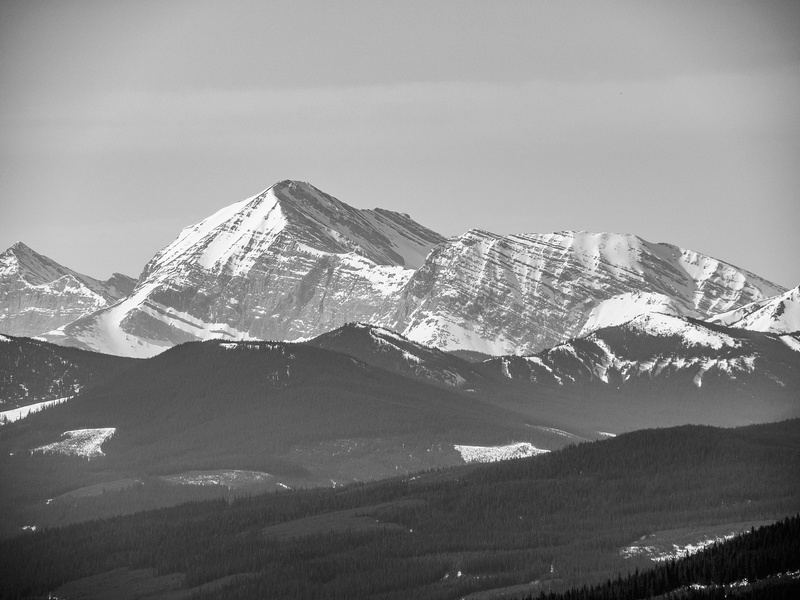 Horned Mountain and Mount Bishop. The broad, grassy ridge near the summit as I start my leisure descent. Looking down the south ridge. 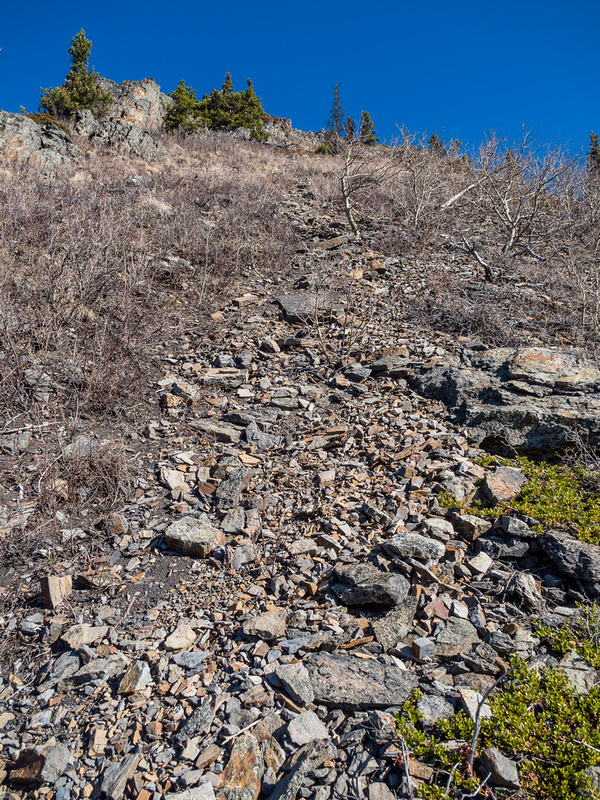 Hikers might find some of the terrain on E-B a bit steep and loose for their liking. I sat on a little plateau for about 45 minutes, while this cheerful little guy kept me company with never ending serenades to his mate. Can't get enough of this gorgeous day! My exit along Etherington Creek visible at bottom going left out of the valley. 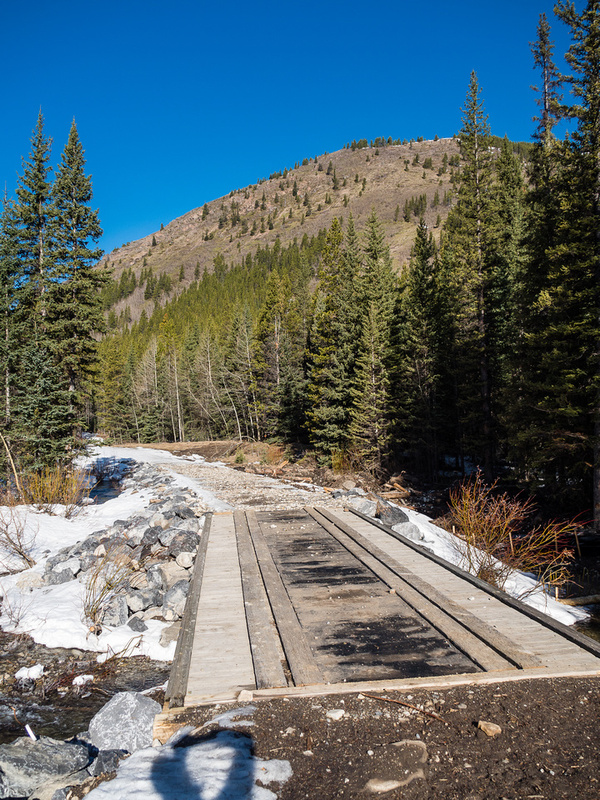 The 2013 floods rerouted some of the approach road along Etherington Creek. 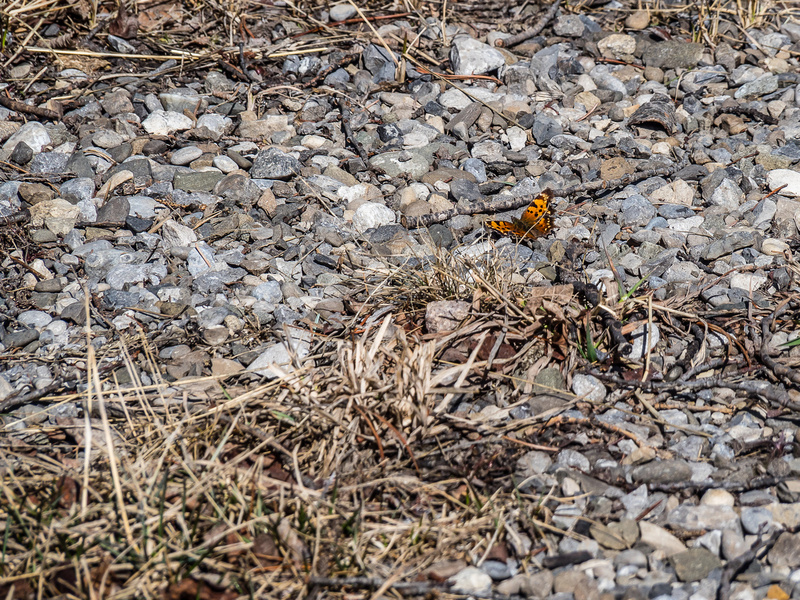 A ton of butterflies were enjoying the warm rocks on the exit road to the parking lot. I started up the steep grassy slope and soon encountered some scrubby trees that were a bit of a pain and reinforced my initial ideas of this ridge. The trees didn’t last long, however, and soon I was looking in amazement across some solid(ish) rock on the ridge and views towards the High Rock Range that frankly, blew my mind. What was this? Views already? Scrambling on dry rock? Hmmm. Maybe all the suffering on this silly summit would be higher up when the snow appeared. For now, I was going to enjoy myself! The next few hundred vertical meters were very enjoyable. 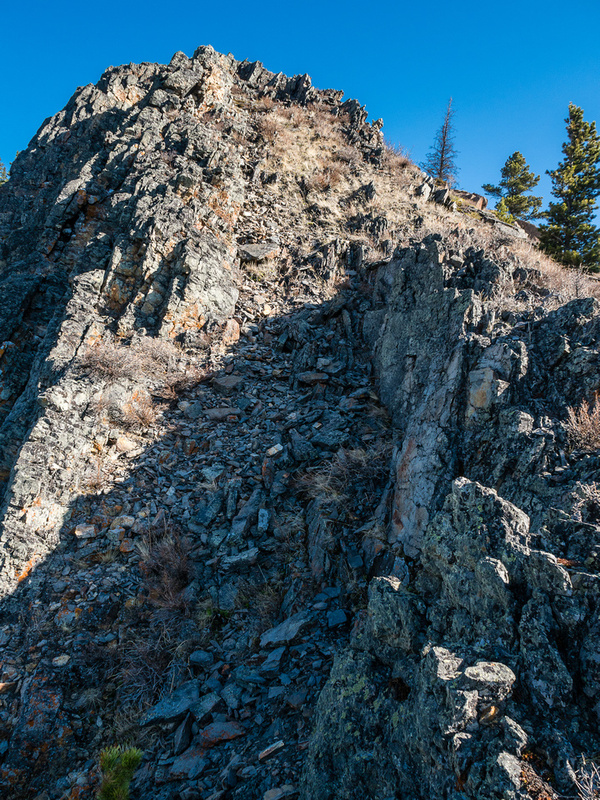 Easy scrambling on rock, with the option of easy hiking on climber’s right. The views were stupendous in the early morning lighting and the sun was warm on my neck as it continued to rise behind me. The birds were going nuts – obviously very satisfied with the summer weather. 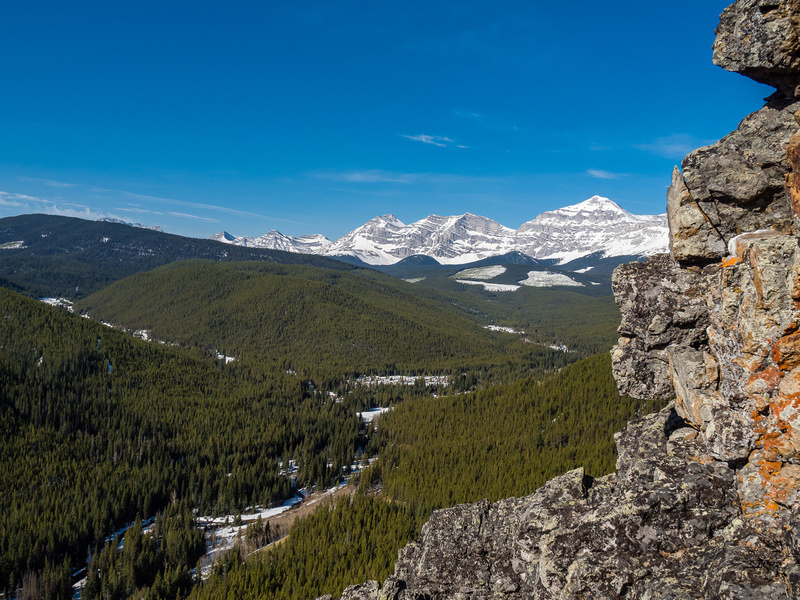 I even spotted a marmot sunning on the rocks along the ridge – an animal I don’t spot often this far south or east in the Rockies. From the top of the easy scrambling, my route just kept looking better and better until I was pretty sure I wasn’t even going to need the snowshoes. This elevated my mood considerably and combined with the zero wind, excellent views and warm weather, I was now enjoying myself despite my best intentions otherwise. Gotta hate it when stupid mountains improve your mood. 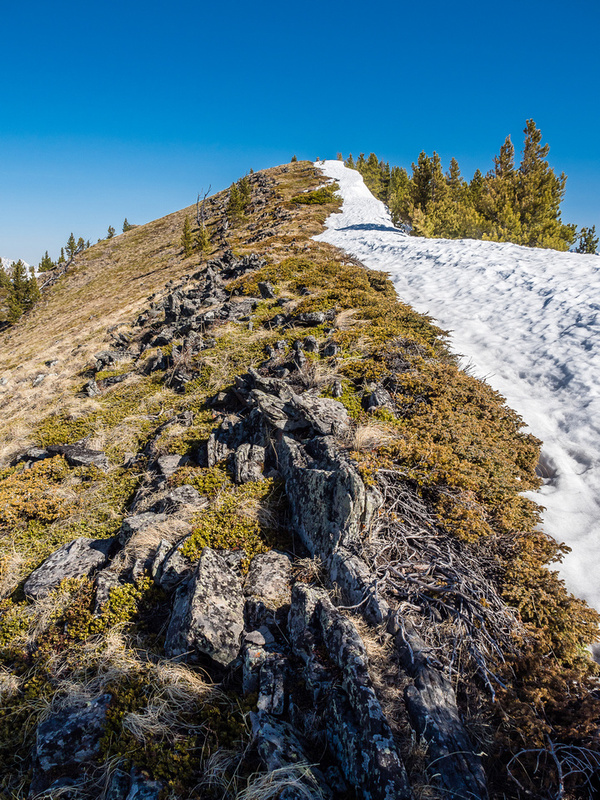 As I started up the last few hundred meters to the summit, I noticed a bow hunter approaching me. We talked in low tones, he indicated his surprise at seeing me. I’ve met hunters before while solo hiking and they always seem pretty surprised to see me. 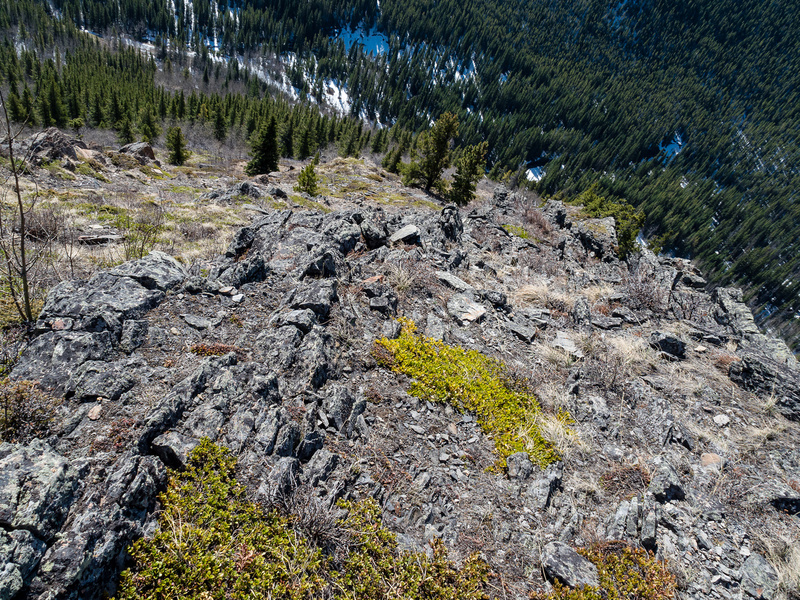 This fellow was hunting black bear with his buddy – they assumed nobody else would be on this ridge. I told him it was an established route published on the Internet and I could see him deflate a bit. 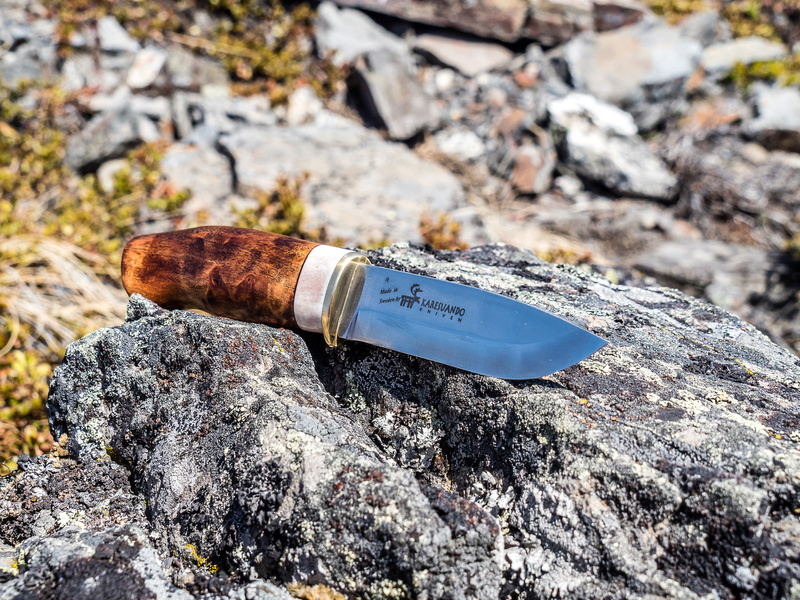 Maybe it’s because they are walking around with weapons meant to kill the “big bad bears”, but hunters I’ve run into, generally consider solo hikers like myself a little crazy to be tramping through the Rockies with nothing more than our bear spray and a knife (if we’re carrying one). I’m afraid with the advent of social media, “secret” hunting spots aren’t going to be “secret” for long… I bid him goodbye, promising to be out of the area soon and continued to the summit. I have to say that the summit views on E-B far exceeded my expectations. 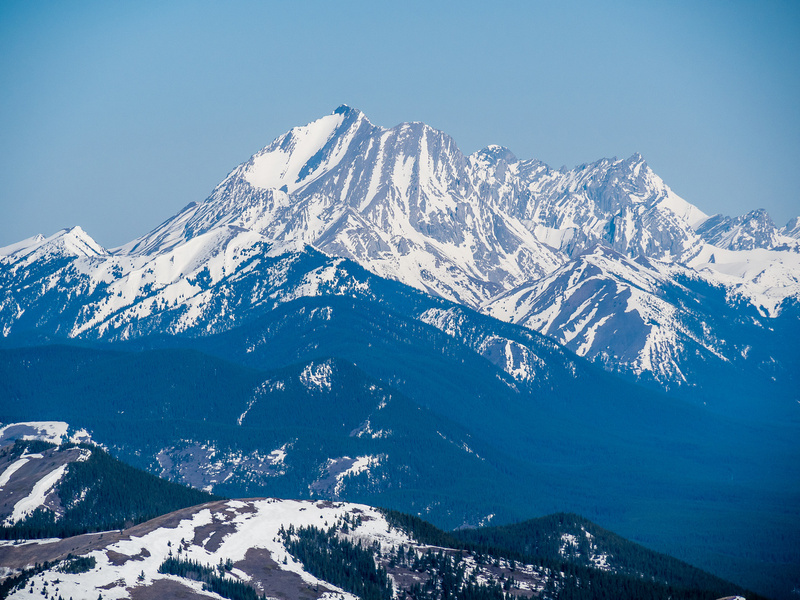 From the huge Mist Mountain to the north to the distinctive High Rock Range peaks to the west, I was certainly not feeling disappointed in choosing such an easy and short hike for this gorgeous, windless “summer” day in the Spring. The smells of growing vegetation, the chirping birds and the snow covered peaks all made me realize yet again how lucky we are to live so close to these natural stress relievers. I spent some time getting reacquainted with recent friends to the west, remembering my excellent summer trip with my daughter, Kaycie, to the Carnarvon Lake area the year previous. 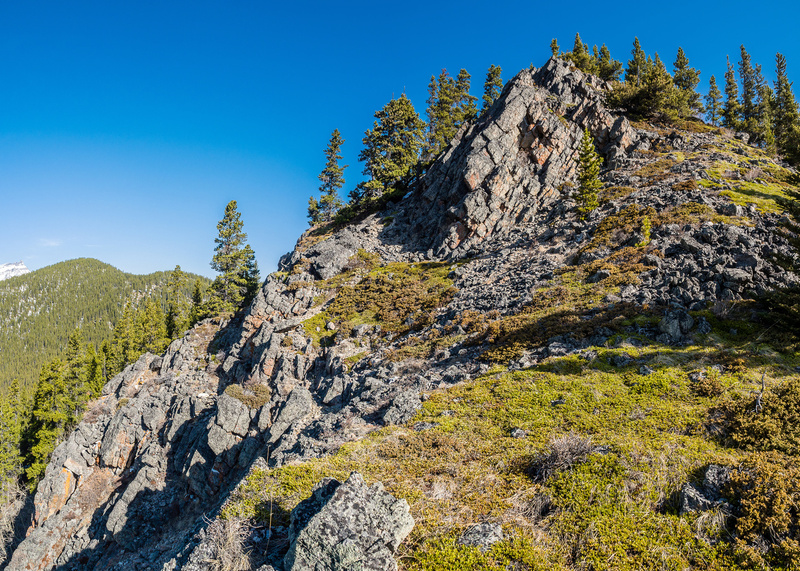 I had a spot part way down the south ridge picked out for a late morning nap, so after taking dozens of photographs and enjoying a water break at the top, I turned back and started hiking back down. The bow hunter stopped me again on descent, this time to inquire about my route. 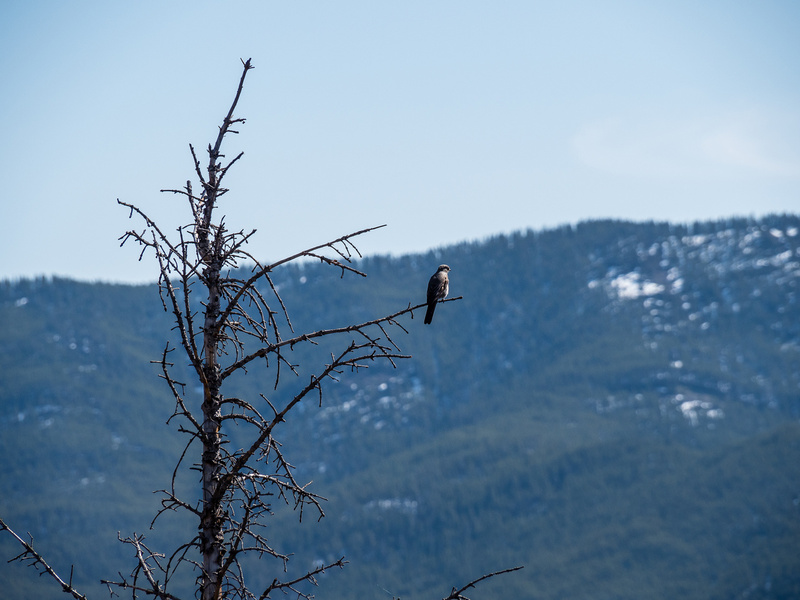 Apparently he and his buddy had bushwhacked up from Etherington Creek to the west of the ridge and were hoping there was an easier descent route, which I assured him there was! After chatting briefly, I kept descending to the little slice of heaven where the marmot was hanging out. Here I sat for around 45 minutes, soaking up the gorgeous sunshine and listening to the chirping birds. A cheerful Etherington Creek far below me sent it’s bubbling sounds up the ridge to complement the atmosphere. In a word? Sublime. Eventually my peakbagging eyes kept darting to the left, looking east towards Hell’s Ridge and wondering if it was really as dry as it looked. I should have known better, but I started my descent anyway. At the parking lot I threw my stuff in the back of the truck and headed off down the road out of the camping area to find the parking spot for my second objective of the day. The appropriately named, “Hell’s Ridge“.